1910 Turn of the century dresses were typically long-sleeved and conservative, often with intricate lace or beadwork. This Jenny Packham dress mimics the detail of Edwardian gowns, yet has a touch of modern flair with the off-white color. 1920 The roaring 20s brought shorter hemlines, sleek and slinky silhouettes, and of course, the rise of the flapper. BHLDN’s Aurora gown ($1,000) replicates the body-hugging styles and detailed beadwork that pretty much defined the decade. 1950 In 1956 Grace Kelly married the Prince of Monaco wearing a breathtaking long-sleeved lace gown that would inspire decades of brides-to-be. We love the oh-so-similar Winslet dress from Monique Lhuillier. 1960 Think short, sweet, and totally retro! 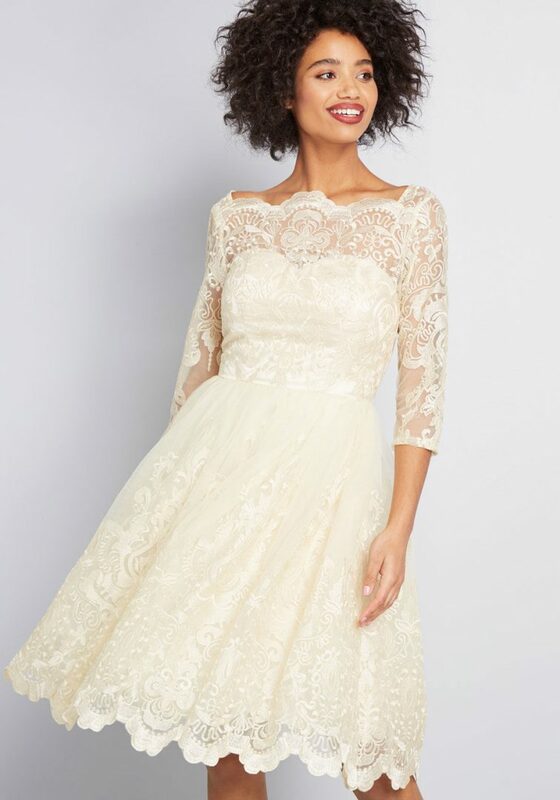 The 1960s were full of playful wedding dresses—like the Gilded Grace Dress ($175) from ModCloth—funky hairstyles, and short veils. 1970 Ethereal, simple, and boho are what the 1970s were all about. Consider a cotton frock like the Magnolia Gown from Free People ($744) for a look that just screams the 70s.